Porcelain inlays and onlays are unique restorations that allow you to restore badly damaged teeth without requiring a full-coverage crown. However, these restorations are sometimes referred to as “three-quarter crowns” because of the fact that they cover 2/3 to 3/4 of your tooth’s surface. Made of porcelain, inlays and onlays are hand-crafted in a dental laboratory the same way a crown is, giving you the perfect fit when it comes to a permanent restoration. Using advancements in cosmetic dentistry, Dr. Sarah Thompson closely matches the color of porcelain so that it matches the color of the tooth surrounding it. Once in place, you won’t even be able to tell that the tooth has an inlay or onlay on it. Choosing cosmetic dental inlays for your restorative needs protects the tooth from the risks associated with a very large filling. When fillings reach a certain size, they can easily fracture or compromise the integrity of the tooth. With an inlay, the restoration can support normal use and allow the tooth to function normally again. If you need to cover a large portion of the tooth but don’t quite need a crown, consider the option of beautiful porcelain onlays. Onlays wrap over the portion of damaged enamel, recreating the surface of the tooth without covering the entire tooth as a whole. Dr. Thompson uses only the strongest porcelain available, giving you beautiful results that last. Will you choose an inlay or onlay for your broken tooth? Not many dentists offer this procedure! 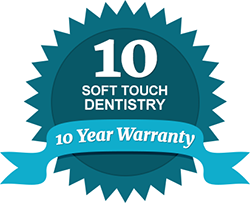 We invite you to contact Soft Touch Dentistry to set up an exam and consultation if you think inlays and onlays might be right for you!